The Rusty-spotted Cat (Prionailurus rubiginosus) is a very small wild cat of southern India and Sri Lanka. It is 35-48 cm (14-17 in) in length, plus 15-25 cm (6-10 in) tail, weighing in at only approximately 1.5 kg (3.3 lbs). Since adult females can weigh as little as 1 kg (2.2 lbs) or less, this species rivals (and may exceed) the Black-footed Cat (Felis nigripes) as the world's smallest wild cat. The color of the fur is grey, with rusty spots all over the back and the flanks, while the underbelly is white with large dark spots. The tail, thick and about half the length of the body, is darker in color than the body and the spots are less distinct. 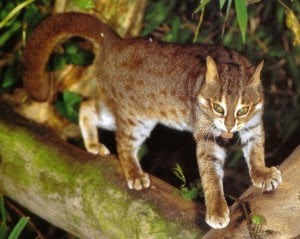 In India, the Rusty-spotted Cat mainly occurs in tropical dry forests and dry grasslands, but in Sri Lanka rainforests are the preferred habitat. 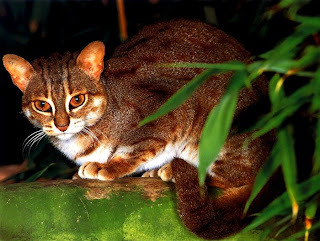 The reason for this difference may be the competition with the Leopard Cat (Prionailurus bengalensis), which occupies the rainforests of the mainland, but does not live in Sri Lanka. The Rusty-spotted Cat faces a high risk of extinction in the wild and is listed as vulnerable on the IUCN Red List. More specifically, the Convention on International Trade in Endangered Species of Wild Flora and Fauna (CITES) lists the Indian population in Appendix I (threatened with extinction where trade in the specimens is only allowed in exceptional circumstances) and the other populations in Appendix II (not necessarily threatened with extinction, but where trade in the furs is strictly controlled). 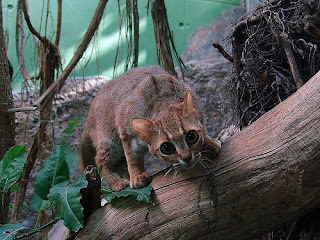 In Sri Lanka, the Rusty-spotted Cat is known as Handun Diviya or Kola Diviya. The terms 'Handun Diviya' and 'Kola Diviya' are also used by the local community to refer to the Fishing Cat (Prionailurus viverrinus), another little-known small cat in suburban habitats of Sri Lanka. Both animals are nocturnal and elusive and therefore distinct identity as to which one is referred as 'Handun Diviya' is arguable. Some authors note the existence of two distinct populations in Sri Lanka, one in the dry zone and the other in the wet zone.